I’m going to have nightmares about this, I just know it. I’m standing on a stage bathed in hot television lights with 2 million people watching me when all of a sudden, the words just stop coming out. People start giggling. Next thing I know I’m standing in my underwear. I wake up in a cold sweat. Oh, thank God, I’m just some anonymous journalist guy, not a politician who just watched his entire political career flash before his eyes. Oh Rick. Rick, Rick, Rick. In easily the most painful moment of an already uneven set of debate performances, the Texas governor on Wednesday night fumbled badly when describing how he would cut government in the CNBC Republican debate. Perry’s lack of knowledge about his own political platform was awkward on the stage and immediately raised eyebrows in the Twitterverse, and could possibly be a pivot point in his campaign with longer-lasting implications for the race. After struggling for a while, Mitt Romney attempted to throw Perry a bone and volunteered “EPA” — the Environmental Protection Agency. But it wasn’t the EPA, so Perry struggled on to hit on the right answer. “The third agency of government I would — I would do away with, Education, the…,” Perry continued to try and find his answer. “Commerce,” an unknown voice volunteered, according to the debate transcript. 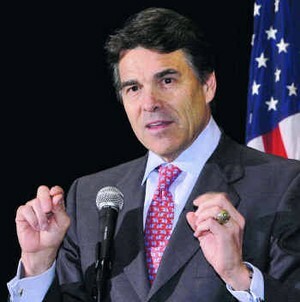 The next time he was asked a question, Perry said the Department of Energy was the third agency he would eliminate. Hey, I’ve done it. I’ve lost my train of thought before. I’ve seen the train careen off the tracks and tumble six times down a ravine before coming to rest in a fiery explosion. It’s happened once or twice. I think I was tired. Or maybe a little tipsy. I’m going to say it just once. When a presidential candidate forgets one of the three government agencies he wants to abolish; forgets which set of 30,000 federal workers he’s going to lay off; forgets it’s the Department of Energy, which you’d think might be the agency most top of mind to the Governor of oil-rich Texas- it’s not a good thing. Even Rick Perry’s supporters were sending out dispirited and demoralized tweets. “The campaign just ended,” said one of them. The folks who put odds on these things downgraded Perry’s chances of getting the nomination by about 30% by the time the debate came to an end. For those Republicans concerned with winning the general election, all they saw last night in that one mortifying minute of debate history was the debate 10 months from now with President Barack Obama behind one lectern and a deer standing at the other. With bright headlights shining into its eyes. One could go on but what’s the use? I will say this- in all sincerity- about Rick Perry. In the spin room afterward, where representatives of the presidential hopefuls show up to tout their candidates fabulous night, Perry did the right and honorable thing. He came out to face the reporters himself. He said he was grateful he was wearing boots, because he had really stepped in it. Kind of like an NFL quarterback who’s just lost the game after 5 interceptions and still goes out to the press room to face the music. I rather admire the character and humility he displayed with that move in the spin room. It may have been the most honest thing said there the whole night. I think I now actually really like Rick Perry. I certainly feel for him. Unfortunately for his presidential aspirations, this was the sort of gaffe that goes down in political and television history and is open-and-shut unrecoverable. But I like how he manned up with the reporters afterward. I’d like to have a drink with the guy. And if it turns out we have a couple too many, we’ll help finish up each others sentences. Like I said, I’ve been there. I’m frequently amazed at how quickly political epitaphs are written after candidates struggle or slip up – even several times. I suspect that all we saw last night was the reality of a first-time candidate for President, who entered the game with the weight of huge expectations on his back, gaining the kind of experience and humility that no other contest offers. Contrast that with Mitt Romney’s performance this time round versus his first run four years ago. The painful reality of experience is that it tests first, and teaches later. I agree with you that Perry’s post-debate actions say more about him than his laps of memory in a timed event. If he’s smart, he’ll stay in the game, take his hits,and learn from this moment. That’s not taking a positioin on his politics, but merely offering an observation that there are two ways to lose a race for anything you want in life – one is to give up when you stumble, the other is to come in second – which, as history proves, isn’t always the end. That, and there’s just no way for the media to write those “come back kid” stories without a few serious stubles along the way. The problem here is that it wasn’t his first gaffe. It added to an already established narrative about him. That’s why even his own supporters understand the gravity of what occurred last night. I just don’t think there is any recovery from this. He’s using humor this morning as part of his damage control and it’s true that who among us hasn’t had a brain freeze like that? Problem is, when it happens to us, it’s not on live television, forever memorialized on YouTube- and-we weren’t running for President of the United States. As you say, you are not running for office but, hey, what’s to stop you, me or any one in this crazy race? From what I understand, and I am learning on the job here, isn’t the candidate’s run based on the level of campaign funding, which will either sink or float the campaign further? Herman Cain’s campaign donations are on the up, what will happen to Rick Perry’s? I agree with the established narative assessment and that his critical issue is keeping his supporters with him after this, I guess we’ll see just how many stay with him down the trail.